Ready for a closer look at iQ Media? 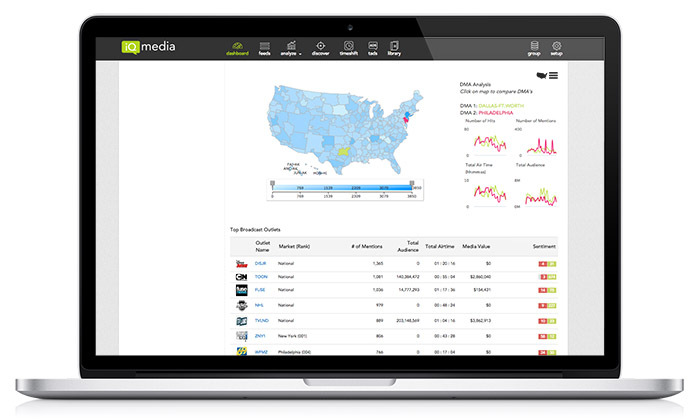 Show how PR impacts your organization’s bottom line, in real-time. Get up close and personal with reporters that matter most to your brand. 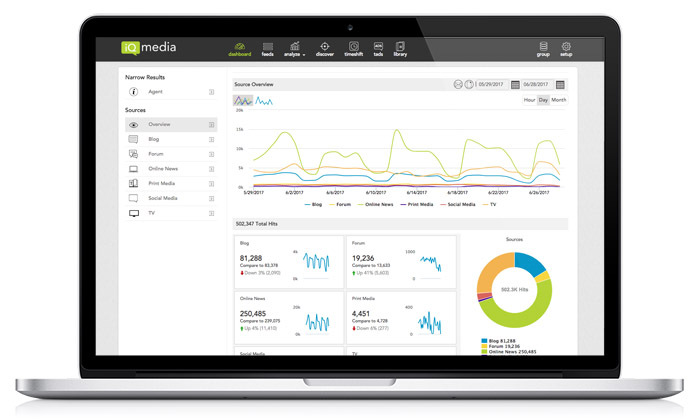 Leverage real-time and historical insights to find the best PR approach. 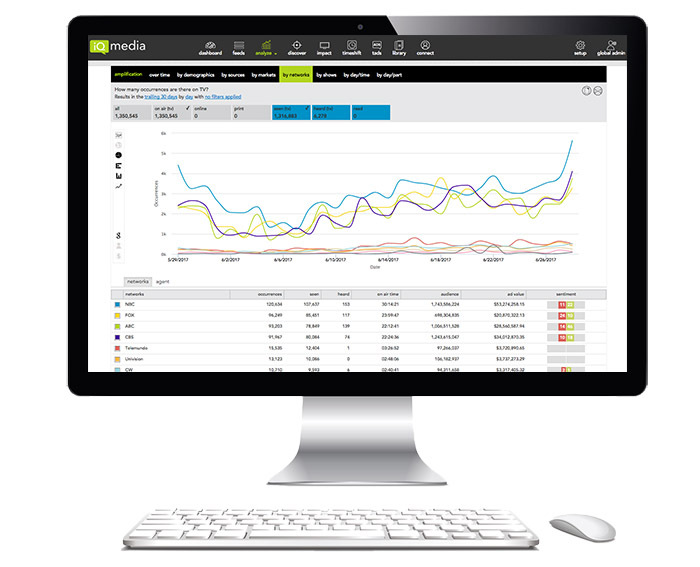 Quickly control a crisis with in-the-moment data and sentiment analysis. Uncover what consumers and reporters are saying about your brand—on all channels, at all times. Understand who your target audience is and shape favorable brand conversations with them. Formulate an earned media strategy and improve future content and media coverage. Show your organization the real impact that PR has on brand awareness, as well as the bottom line. 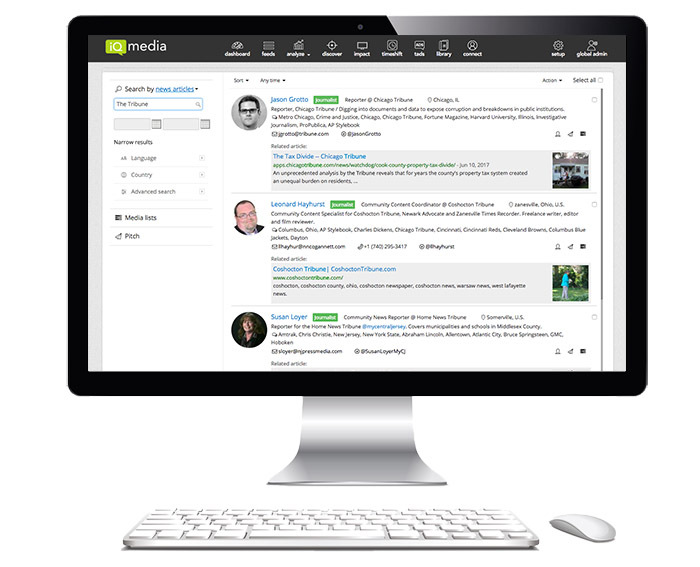 Identify relevant reporters, bloggers, and social media influencers through both authored news content and topic areas. Personalize your pitches with detailed, up-to-date contact information, authorship and Twitter history. Save time by communicating with targeted groups of contacts or individuals directly from the iQ platform. Track performance and optimize your strategy with open rate and click-thru reports. Gauge your results against similar companies and the competition to determine if your PR strategy is meeting its goals. Prove the value of your PR program while also setting benchmarks over time for a year-over-year comparison. Easily marry your media efforts to sales or other internal KPIs in order to pinpoint marketing ROI. Focus your crisis response tactics and instantly reveal who, where, when and how your story is being covered by sentiment, by station, by city or even by reporter. Effectively address issues across local, global and national channels. Become better prepared for any future crisis situation with historical analysis and coverage access. READY TO TAKE A CLOSER LOOK AT iQ MEDIA?